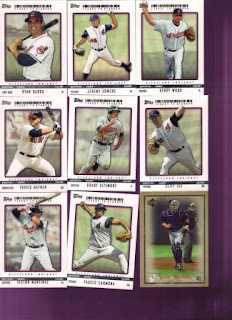 Indians Baseball Cards: Thoughts-N-Sox thought of Tribecards! Adam over at Thoughts-N-Sox sent a package to me back in January. I didn't open it (much like several other packages lately) until just now to scan them in. 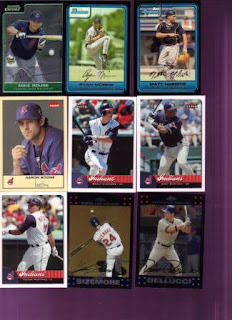 I have to say there is a wide array of Tribe cards in here for sure! I love gold cards. Maybe it's the implied prestige of the gold, or maybe I just like shiny things. Either way, I got plenty of both in this package! There are chrome cards, too, adding even more shininess to the mix! You'll notice a couple minis in there as well. Excellent! In the next group, we have more shiny chrome and some Fleer cards, too. 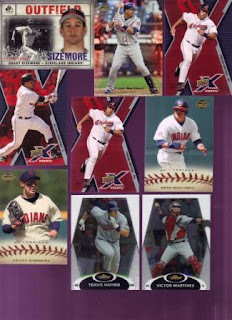 I may be in the minority (not sure, never took a poll), but I always liked the Fleer brand. I was not a great fan when UD took over for them (since, you know, it was just UD with emperor's clothes on), but Fleer has always held a special place in my nostalgic psyche. Okay, okay, no more tissue talk. And then we have die-cuts! I love die cuts. 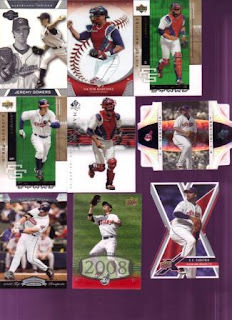 Both of these are of CC Sabathia which makes them even cooler in my book (for no real reason other than I think it is great both cut cards of the same player. Work with me, people!). I am also a fan of the embossed cards (like the Ovation above). 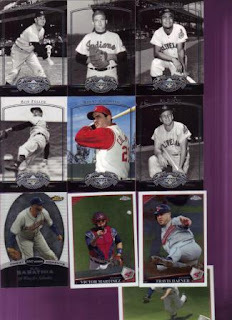 I digress here for a moment, but I thought the 1965 Topps Embossed were some of the coolest cards ever made. Hmm, I need a thesaurus - just how many times can I use the word 'cool' anyway? And now, some sweetness - UD Past-Time Pennants. If I have seen these, I don't remember it. I am loving these cards! The things you can do with Photoshop these days makes these cards look like the photos were taken just before the cards were made. Superb! Sorry about the cut-off Grady there at the bottom. I really will get the hang of scanning one of these days. Or not. You know, it makes for interested conversation. Well, at least I like to tell myself that. THANK YOU so much, Adam! These are going to be wonderful additions to my collection! Big fan of the Gold cards as well! I went to school a few hours outside of Cleveland and loved making it out to see the Indians play. Anyway, I'm glad you liked them. Hopefully you still needed them because when I sent them they were all on your want list. I was afraid that if I opened them, I would forget who sent me what. I'm a bit scatter-brained, you know!